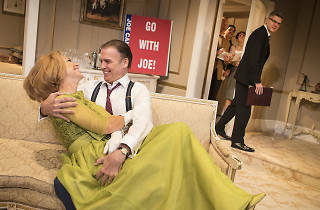 This Gore Vidal play premiered on Broadway in 1960 and was never staged in the UK. But in an era of wildly unpredictable elections, populist politicians and unprecedented mud-slinging, ‘The Best Man’ has found its moment. At a party convention in Philadelphia, two very different wannabe presidents battle it out: the intellectual, well-off and well-educated William Russell versus the chest-thumping self-made man Joe Cantwell, who’ll say anything to appear a man of the people, and do anything to win. In the first ten minutes, lines about unreliable polls, popularity contests, mistrust of intellectuals and a misleading press land like they’d been written last week. But ‘The Best Man’ is still a period piece in many ways, and rightly treated as such by director Simon Evans. Kudos, by the way, to him and the women on stage for giving the fluffy but potentially faintly tragic female roles some bite: chilly and pointed as an icicle, Maureen Lipman ironises her ‘woman’s touch’ waffle as an indomitable party member, while Glynis Barber finds some zinging resistance as William Russell’s sexually spurned yet loyal wife. Martin Shaw strikes an appropriate balance of gravity and levity as William, managing to pull off moral righteousness without appearing too pompous. He finds a worthwhile opponent in Jeff Fahey as Joe Cantwell, all puffed chest and slicked hair, confidence shading into brashness. The script features bursts of smart-talking, snappy dialogue, but there are also quite long stretches of dry political chat. Taking place statically in a cream and gold hotel room, ‘The Best Man’ is theatrically pretty inert; I could imagine it working better on screen (it was made into a move in 1964). It’s timely, yes, and a solid production, but never feels that urgent. 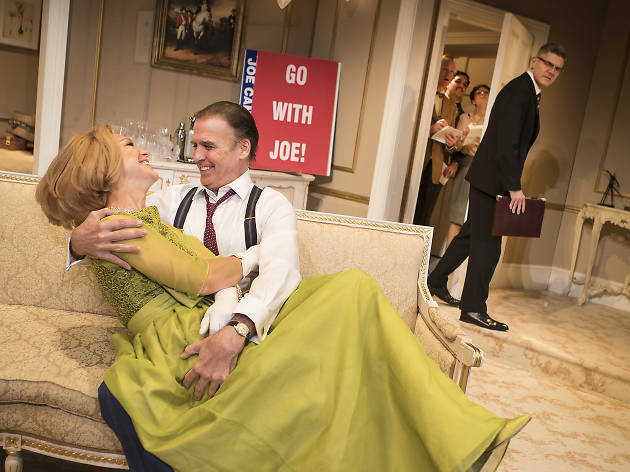 The play is set at a presidential nominating convention where two politicians – the experienced former Secretary William Russell, and the ruthless Senator Joe Cantwell are competing in the election campaign. Cantwell decides to play dirty, threatening to show his opponent as mentally unstable if he doesn’t withdraw; Russell decides to act morally and when W Russell realises that he might loose and understanding that it would be wrong for the power to go J Cantwell, he surrender his campaign and gives out his votes to the third (unknown) runner for presidency. The play is slightly flat even though it would probably appeal to those who appreciate politics. And despite some interesting political discussions, it is still somehow unmoving. The staging is attractive, there are good number of actors but it still doesn’t make it captivating enough.